The Brackla distillery was built in 1812 by Captain William Fraser of Brackla House on the Cawdor Castle Estate in Inverness-shire. Such was the quality of its spirits, the distillery was the first to be granted a Royal Warrant by King William IV in 1833 as the chosen whisky of his court- The warrant was renewed by Queen Victoria in 1838. The nose offers soft, fruity aromas, with a drift of peatiness seeping through layers of honey. 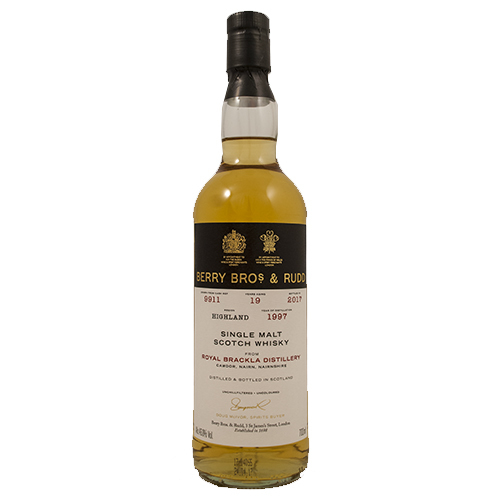 The palate is smooth and builds gradually, with a beautiful softly-textured feel to deliver bouts of ripe fruit, gridered by some delicate peaty notes.